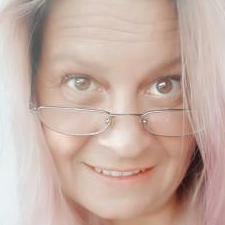 This is pretty set made by Johanna Hasselbrink‎. It consists of two practical little handbags. Both of them are made of natural rough material. You may use one or two of them at same time. Front side of each work piece is decorated with same embroidery sample. 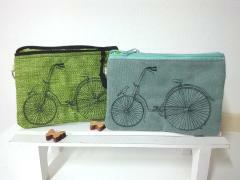 It is Blue bicycle free embroidery design. It is quite simple but cute picture which is executed with only one color of thread. This is pretty little cushion prepared as memorable handmade souvenir for beloved addressee. Warm feelings are clear in all its details. They are beautiful printed fabric with calm design, tender lace and Star angel embroidery design used as center of composition. It is also added by thematic inscription. Photo of this cushion is made with suitable details which underline its beauty. This is pretty colorful picture executed in natural shades. It is able to embellish any interior in classic or modern style. But if you look at it carefully you may note its interesting feature which makes it true highlight of your home. 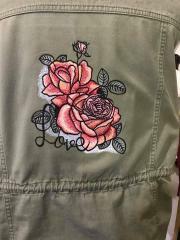 It is not painted, it is embroidered! Yes, author used Flowers pattern to make this incredibly amazing picture. This is pretty woman’s bag executed from practical leather. It has beautiful and very well elaborated elegant design. Its color scheme is based on natural shades. Embroidery sample supports this idea. It is Night magic bouquet embroidery design. This is complex and amazing floral ornament with many flowers, leaves and even butterflies. Drawstring at top of this bag looks like plant stem. 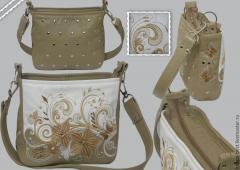 This is embroidered bag decorated with beautiful sample. It is Night magic bouquet embroidery design. This nice picture is added with original metal furniture. It embellishes back side of this work piece. Furthermore little rivets are used as middle of flowers. Together these two elements create truly unique and inimitable design. You can look at it from all sides due to our informative picture. This is simple and stylish interior cushion executed from rough natural material. Its front side is decorated with Dwarves machine embroidery design. This pretty and original picture shows three merry dwarves with fluffy beards in different caps. 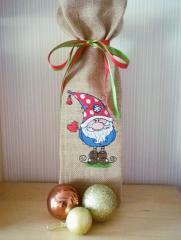 One of them keeps lamp in his hands and other already prepared little gift for his friend. All of them wear warm mittens of bright colors. This picture shows very original way of decoration of clothing with embroidery. You may often see it on t-shirts and blouses, but here it is on… woman’s trousers. It was very beautiful! Yellow roses free embroidery design 27 seems to be organic part of this clothing. Please note how author changes original color scheme of this sample. This option is much better for trousers’ shade. 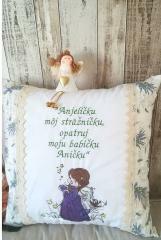 This is funny embroidered cushion which can be true highlight of your interior. Originally it was made of fabric of calm natural colors. 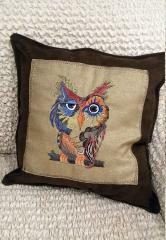 But due to Owl in color free embroidery design it becomes really stylish and original. This picture shows a bit crazy bird which consists of many colorful details. Together they create interesting portrait which slightly reminds pictures of Salvador Dali. This is nice embroidered backpack decorated in folk style. Its cover is embellished by beautiful ornament based on traditional ornament of Native Americans. It has bright colors and interesting curved forms which make it very original and memorable. Native American curtains embroidery design will be suitable for persons who like to be original and unique. You may use this sample for other kinds of work pieces. On this picture you may see part of brutal leather bag executed from practical dark one. Its style is made with Orange horse machine embroidery design. This interesting picture perfectly underlines beauty of natural material. It is embroidered in calm color scheme. Sample of floral style consists of images of horse with waving mane and beautiful flowers in front of it. 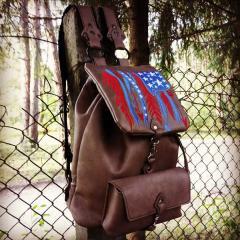 This is cool city backpack executed from practical leather. It is made in natural color scheme and embroidery sample is chosen suitably. It is Deer head embroidery design. Elegant and light picture looks very nobly. It reminds coat of arms of old English family. 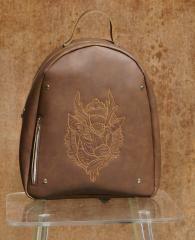 Due to this picture simple design of this bag become very interesting and original. Size of image fits backpack very well. 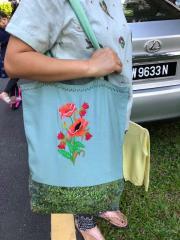 This picture shows us close up plan of textile bag decorated with Poppies free embroidery design. This pretty embroidery sample is great at role of this composition’s center. It perfectly underlines its bright colors and general idea based on usage of natural style. It is supported by low part of bag which is executed with piece of fabric with print of leaves. When you look at this work piece carefully you may note leafy ornament at bag’s top. 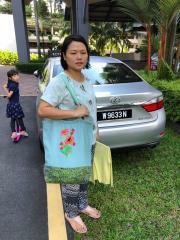 This is convenient and spacious textile bag in natural style. Its low part is decorated by printed fabric with branches and leaves. 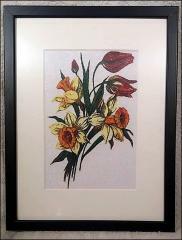 Central part of its composition is Poppies free embroidery design. This bright sample shows colorful bouquet of poppies which contains both opened flowers and little buds. It perfectly combines with design element used at bottom. Bag with this sample is nice accessory and useful thing for shopping at the same time.